Efficient and cost effective, the Optima Series provides proven performance and technology in numerous application such as Food & Beverage, Life Sciences and Microelectronics. The Optima™ series was designed with a sophisticated sizing program, combining Multiple Source Summation (MPSS) and Computational Fluid Dynamics (CFD), critical in calculating fluency rates, flow patterns and velocity distribution. 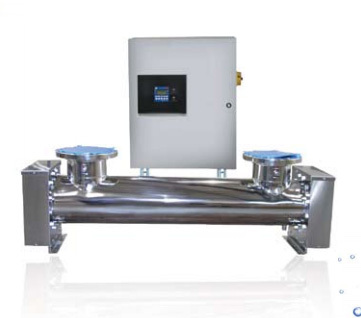 The series consists of 316L stainless steel treatment chamber and a stainless steel control panel in one integral unit for models with reactors up to 8” in diameter. Models HX 02BDSU and above have a standard UL TYPE – 1 painted carbon steel control cabinet. With low-pressure high-output lamp (LPHO) technology, the HX lamp provides increased process performance and extended lamp life, while the systems compact size allows for a smaller footprint, maximizing installations flexibility. Single-ended (SE) HX lamps allow quick change-outs without tools. Utilized for ozone destruction and disinfection, the Optima™ is not only cost effective, but proves to be a reliable, innovative and environmentally smart alternative. While disinfection is the most common application for ultraviolet (UV) technology in water treatment, ozone destruction is also used. Prior to point-of-use, the residual ozone needs to be destroyed to ensure the process water is not compromised. After considering the appropriate variables, a properly sized UV unit can be guaranteed to destroy the ozone to non-detectable limits, ensuring the integrity of the process and product. UV does not ‘add’ anything to the water stream such as undesirable color, odor, chemicals, taste or flavor, nor does it generate harmful by-products. UV only imparts energy to the water stream in the form of ultraviolet light to inactivate micro-organisms or reduce chemical compounds present in the water.